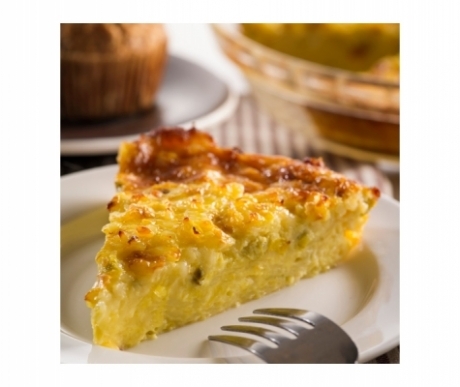 This breakfast pie is perfect for a Saturday morning brunch. 1. Preheat oven to 400 degrees. In a mixing bowl, combine eggs, flour, cottage cheese and green chills. 2. Beat well at medium speed with electric mixer. 3. Stir in remaining ingredients and pour into a well-greased, 9-inch pie plate. 4. Bake for 10 minutes at 400 degrees, and then reduce oven temperature to 350 degrees and bake 20 to 22 minutes longer, or until set. 5. Cut into wedges for serving. Enjoy! Tip: To make your morning even easier, prepare this pie the night before; cover and refrigerate, then bake it in the morning. Be sure to allow the dish to come to room temperature before putting it into the hot oven.